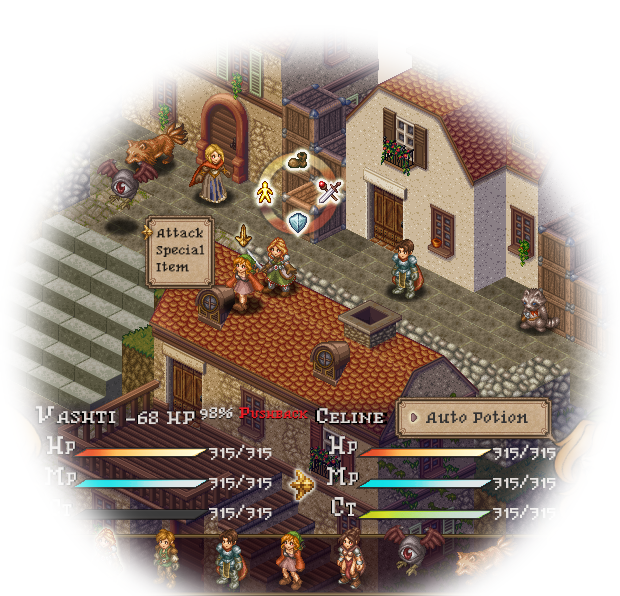 Perfectly pixeled isometric SRPG featuring dynamic job classes, character driven plot, strategic grid battles & an eclectic jazz OST. 2,390 backers pledged $95,204 to help bring this project to life. Was it a lighthouse? A time rift? Who can say, but Booker and Elizabeth are coming to Arcadian Atlas! Arcadian Atlas is a 2D isometric tactical role playing game about the choices people make in pursuit of the things they love, and the havoc it wreaks on a kingdom. Watch your footing and mind the strategic vantage points as you traverse the richly detailed pixel art world of Arcadia -- A single misstep on the battlefield could cost you a friend’s life. Let the moody jazz soundtrack carry you through a thought provoking & ruthless story of love, deceit, murder, companionship and war. Meant to be a fresh take on the classic strategy RPG style, Arcadian Atlas was designed from the ground up to incorporate more challenging battle strategies, new & balanced job classes, and more cutthroat plot twists that'll leave these complex characters' lives hanging in the balance. Featuring dynamic job classes, a rich character driven narrative, strategic grid-based battles and a jazz infused soundtrack, Arcadian Atlas is a lushly handcrafted 2D isometric tactical RPG that takes the rich history of the genre and makes it fresh. We'll send out a questionnaire to all backers to check if you purchased add-ons along with which were purchased so we ensure everyone gets their extra goodies! All backers can choose the digital version of the game in any of these formats: Windows PC, Mac, or Linux! Stay tuned for more platforms in our stretch goals! The Arcadian royal family is in shambles: a dying king, an illegitimate daughter vying for a throne, and a country tearing itself apart. Every day more eastern troops cross the mountains and pillage local villages, and rumors of an uprising are whispered by desperate men. What a wonderful time to be a soldier. Enter Desmond and Vashti, two soldiers in the Royal Guard who take orders directly from the Queen. They met on the edge of war, fell in love in the face of adversity, and learned to laugh even when things seemed dire. But can love survive when two sides with very different motives threatens to pull it apart? Can anything survive at all? The core philosophy behind Arcadian Atlas is simple: Challenging strategic battles with unique classes that make every fight a different experience. That means terrain that affects your movement, cover that can hinder the best laid plans, and skills that are never wasted. For our base funding goal, we have a 10 hour experience planned, and our dream game (essentially double that funding goal) will double that content with expanded story missions, side quests, customization options, and more classes/skills. Investment matters, and in a tactical RPG your biggest investment is your character class. So we want them to be purposeful, which is why classes in Arcadian Atlas have several core builds that your characters develop over the course of the game. That means no class hopping, but instead class evolution. Customize your character at the start with their preferred class build, and when the time comes you can specialize that build through branching evolved classes with entire skill trees all their own. Ranger - the master of area control, a Ranger’s knowledge of deadly plants and skill with a bow means wielding the environment to cripple and crush the enemy. Apothecary - a chemist of extraordinary skill, the Apothecary’s potent brews and experimental arts can heal or wreck devastating damage on the battlefield. Rogue - sneaky, sneaky; stabby, stabby. The Rogue isn’t interested in manners - why bother when slashing an achilles heel or a surprise attack does the job faster? Warmancer - adept at brute force and powerful magics, the warmancer specializes in harnessing latent energies for devastating area of affect spells. And that's just the beginning! Outside those and other core classes, we also have two Advanced Classes for each Base class! At a certain job level, you'll open up two advanced classes to choose from that further specialize your troops! Start by molding each of your characters with your preferred stats to make that rogue a tiny bit stronger so backstab damage finishes foes off in one swoop, or quicker to get in and out of a conflict in a pinch. And skills, our favorite part of any tactical RPG. Nothing wasted, everything with a purpose: that's our skill philosophy, so our skill system consists of branching specializations for each class. Start out with your choice of weapon mastery skills which dictate how you want that class to play. Want your Ranger to master the wider range and faster movement skills of a bow, or the sheer power and crippling attacks from a crossbow? Choose based on your style and watch as new branches open with more powerful and unique abilities to compliment that style. Arcadia is a sprawling continent divided by immense mountains, with landscapes as varied as the inhabitants. We’re looking forward to bringing those ecosystems into the battle system by creating a breathtaking pixel world that is as treacherous as it is gorgeous. Thick snowfall, dense forests, rushing rivers, tiered cities - every map affects the way you approach a fight and alters your strategy. Make use of trees to protect yourself from that line of rangers ahead, or place your apothecary opposite an enemy knight with rushing rapids between them while you wear away his armor with acid bottles. Something different - that’s what we set out to capture with our soundtrack. Jazzy saxophone, toe-tapping grooves in the weapon shop, and funky trip-hop beats as you march to battle in a seaside village - we wanted the audio to be infinitely listenable, both in-game and out. With its recurring musical themes and motifs giving a nod to RPG composers’ greats, Arcadian Atlas’ melody-driven soundtrack will merge a sound bed of symphonic jazz with elements of trip-hop, soul and funk. A wide range of live-recorded instrumentalists recorded through vintage microphones and equipment will set the right mood for each scene, providing an earthy, hand-made and clearly unique tone throughout the game. Established in 2015, Twin Otter Studios is an independent game studio helmed by Becca and Taylor Bair, a brother and sister duo based in Texas. We grew up entrenched in the golden age of SNES and Playstation masterpieces, eventually carving our own game development path by crafting the 15+ hour RPG title Genesis. Arcadian Atlas is a passion project birthed from a love of pixel masterpieces in the 90’s and a longing to make a fresh tactical RPG with roots firmly planted in the genre’s classics. Our team’s experience spans games like Vidar, Fort Meow, Lugdunon, Dreamblazers, Solar Crusaders, and Genesis, with over 18 years in the industry, so we know how to manage talent, finances, and time to create wonderful game experiences. We’ve got phenomenal talent behind us, and we’re serious about crafting an experience that will go down as a true classic of the tactical RPG genre. Whether it be melodies that quicken the pulse, pixel art that leaves you breathless, gameplay that challenges even the most hardened tactics veterans, or characters that you fall in love with, Arcadian Atlas is a platform where our passion and talent have no ceiling. That excites us, and we’re glad our Kickstarter backers get to be an integral part. Community is essential. We’ve learned that projects sink or swim based on the people supporting them, and Kickstarter was the best avenue we could think of to allow the community to bring this project to life. It’s a dream we’ve had for years to see the golden era of pixel art meet another great tactical RPG in the vein of Tactics Ogre, Fire Emblem, Vandal Hearts and the FFT series. And financially, it makes sense. Game development is expensive; we can’t pretend it isn’t. It’s expensive on time just as much as it is on the wallet, and Kickstarter funds give us the chance to speed production and make Arcadian Atlas the game we’ve dreamed it could be. Without finances, that simply isn’t possible. We’re glad to be dependent on you. It keeps us accountable, and that’s necessary. We want feedback, and Kickstarter is the perfect forum for it, both financial and verbal. All game developers face challenges and unforeseen obstacles, and Twin Otter Studios is no different. Development revolves around the key resources of money and time, and the main risks of this and any game project involve anticipating timelines and resource management. We see the greatest obstacle as crafting a well balanced game that walks the line between challenging veterans and allowing multiple paths of improvement for newer players to the tactical RPG genre. That's why we will incorporate various stages of quality assurance and balance testing throughout the project ramping up to the final release. If programming obstacles or unforeseen events arise, this could always push the release date of the game beyond the February 1st, 2018 goal, though we have years of experience in the field and have ensured there is flex in both our schedules and budget to accommodate those events. Regardless of the outcome of this Kickstarter, we will produce this game, but the resources from this Kickstarter will speed and improve that process, and we're excited about that prospect. Help us make our dream game or just buy us a beer! You get a digital copy of the game for PC or Mac! *Because this is a limited tier, it is NOT included in any of the following tiers. You get a digital copy of the custom soundtrack in MP3 format and a making-of video feature with us being weird! Get early access to the game for beta testing to feed back bugs and help us with balance testing! For those who want to go digital-only, this tier includes a pdf version of the art book and the digital instruction manual! You get a cloth map of Arcadia, 2 buttons with characters from the game, and a digital instruction manual with tips and tricks! You get 4 high quality tarot card sized playing cards with custom tarot card designs from the game! A name of your choosing is randomly placed on enemy and allied soldiers in battles and recruitment centers! (name subject to developer approval) And your name is added to the credits as a contributor! High quality paperback art book with over 100 full-color pages of art, exclusive designs, and commentary from creators Becca and Taylor. Hand signed by both! Special gift for you to equip that has low chance to turn enemies into raccoons! Exclusive to Kickstarter backers! Work with us to design equippable boots. This item will be hidden in a treasure chest somewhere in the world and have a description unique to the object’s significance! Work with us to design an equippable helmet. This item will be hidden in a treasure chest somewhere in the world and have a description unique to the object’s significance! Work with us to design an equippable accessory. This item will be hidden in a treasure chest somewhere in the world and have a description unique to the object’s significance! Work with us to design a pub quest you can send your hired mercenaries on! You’ll work with us from inception to implementation in the game along with player rewards! You will be turned into an in-game non-playable character and reside in Arcadia. Includes prints of your pixel self signed by Becca Bair & mailed to you! Let’s hang out and eat pizza and drink beer/your drink of choice while we sing Karaoke (if that's your thing). We’ll talk gamedev and share cool secret concept art, works in progress and other neat things your friends will be totally jealous about. We’ll also laugh. So much laughing. - Winner must pay travel and accommodation expenses to Dallas or Austin, Texas. - We’ll pay for the pizza and drinks and drive you around!